Pneumatic systems are just like hydraulic systems with the only difference being usage of compressed air instead of hydraulic fluid. Powered by auto or manual valves, pneumatic systems use a compressor to move pressure to its various parts. Pneumatic systems perform different roles in different industrial settings. Whereas a pneumatic press machine can stamp various shapes for use in the automotive industry, different hose types can be produced by a pneumatic hose machine. Pneumatics also power certain automobile parts such as brakes, power steering, automatic transmissions and shock absorbers. They are also used as power units and spinning motors on a Ferris wheel. Due to their role in industrial settings, it’s important to repair them fast in case of a breakdown. We offer pneumatic repair services to solve problems that might impair the function of pneumatic systems, leading to reduced performance. We also cover the same brands for our pneumatic cylinder repair, pneumatic valve repair and pneumatic compressor repair solutions. We have a large base of customers that access our pneumatic compressor repair solutions. Maintenance managers, plant managers, industrial plant managers, maintenance planners, maintenance supervisors, maintenance technicians and purchasing agents make up the majority of our audience. The pneumatic system has leaking valves. 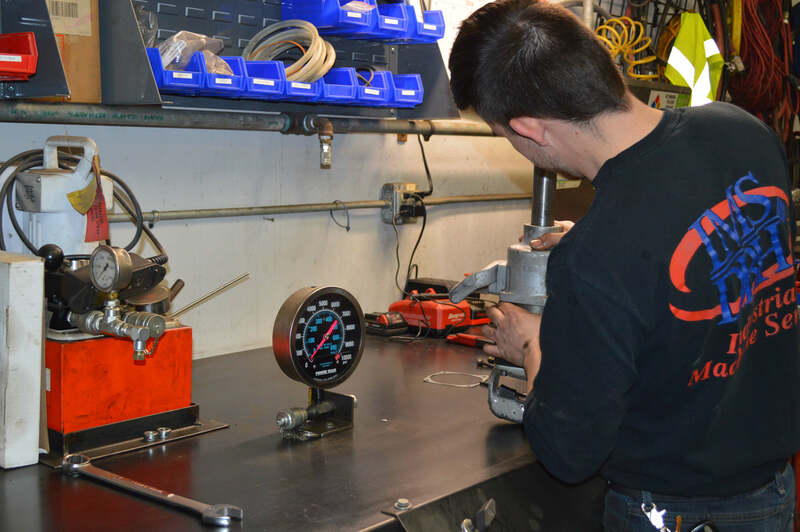 Our pneumatic repair service is unique from competition because we offer full service, including troubleshooting, repair, installation, and testing. We also sell pneumatic tool parts, tubes, and fittings in-house, so we’re truly a one-stop-shop for all your pneumatic repair needs. The in-house pneumatic components we sell ensure you don’t have to wait on us to order parts from a third-party vendor. This allows us to get you back up and running faster. We have more than 60 years of combined experience working on production line machinery and hydraulic systems. This has earned us a good reputation as a trustworthy company. We test all our repairs to ensure they meet factory specifications and industry standards, before leaving the job as completed. A pneumatic cylinder, also known as a pneumatic motor, is a mechanical actuator that uses a linear stroke to generate a linear force. Whereas a pneumatic pump acts as a system’s generator, a pneumatic cylinder plays the role of a motor. When your pneumatic cylinder fails, the whole system malfunctions, leading to poor performance. We offer pneumatic cylinder repair solutions to get your system back up and running. This ensures that your company incurs no losses or customers as a result of the failed pneumatic system. Valves control pressure, flow and direction within pneumatic systems. This eliminates the need for pipes in between pneumatic valves. If they fail, proper functioning of the system is impaired, leading to reduced performance and loss of money. We offer pneumatic valve repair solutions to get your system back up and running for improved performance. Powered by electricity or gas, pneumatic compressors convert mechanical motion and force into the power of pneumatic compressed air. Some compressors are hand-driven. The three major positive displacement compressor types include: piston, screw and dynamic. Compressor helps supply pressure within pneumatic systems. They ensure that pneumatic systems receive pressurized pneumatic compressed air. The right component produces a mechanical force from the pressure. A filtration system is used to remove any particles in the pneumatic compressed air that can damage the compressors. The temperature and pressure of a pneumatic system determine the compressor material of choice to reduce wear and tear. Since pneumatic compressors are aimed at improving the efficiency and precision of pneumatic systems, performance deteriorates if they fail. When they fail, the whole system malfunctions. This is where the solutions of a pneumatic compressor shop near you come in. We offer pneumatic compressor repair solutions to help solve issues related to your pneumatic compressor. It’s our quality solutions, industry experience worth decades, an experienced team of pneumatic experts and a pool of state-of-the-art modern equipment, machinery and parts that differentiates us from our competition. We can partner and work together long-term to ensure that your pneumatic systems run smoothly and in case of failure, get the broken components replaced as soon as possible, or get your new plant’s pneumatic system up and running. We assure you of quality solutions to meet your needs and great outcomes to keep you happy. After all, your happiness is our happiness and so is your success. As such, your needs and happiness comes first. Therefore, we do what’s within our powers to provide hydraulic repair services tailored to meet your unique needs. We are here for you. Are you looking for a pneumatic tool repair shop? Call IMS today for your pneumatic repair needs.